One of my staple breakfast sandwiches that I pick up on the way to the ferry. Cheese and vegetarian ham from the Green Cottage on Lamma. This is a great drawing and I am glad to see you ate some of it as you drew. It has so much texture with the bag, bread and various fillings it goes to show how talented you are. Bella has said it all. I like the remains on the right of the page. Love your sketch. What is vegetarian ham? Seems an oxymoron. Ham that is not really ham, but tastes like ham? Looks good enough to eat...I couldn't sit and paint without eating it actually! I am so happy to see you not stopping now that the sketchbook project is finished! Love the sketch! It made me hungry too :)! Thanks for your comments everyone, I actually ate most of the first half straight away! Vegetarian ham is pretend ham,I don't eat meat so it's sometimes good to have that meat texture and it does taste vaguely like ham. Glad you explained about vegetarian ham. I was beginning to wonder. Great sketch, and your sketchbook project is outstanding!!!! It looks delicious and is very well done. I agree with Bella; the textures look so complicated! You are definitely talented! Wow, it is so realistic! looks delicious! =) I just ate and I must say I wouldn't mind having a bite of that! Great sketch! sandwich looks yummy. I'm afraid to ask what vegetarian ham is. 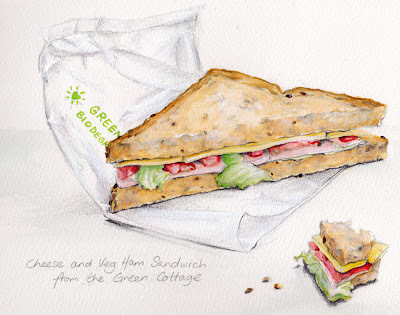 this is so beautifully drawn, i want to take a bite!